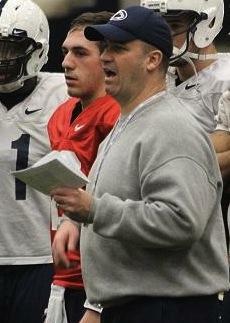 Bill O'Brien (right) talks to quarterback Steven Bench during a Penn State football practice last month in Holuba Hall. Photo by Ben Jones, StateCollege.com. The Blue-White Game, 12 days away, is technically a practice for the Penn State football team – its 15th and final practice of spring drills. But what matters more than that glorified scrimmage are the Nittany Lions’ next six days. That’s when they’ll cram in four practices and get a lot of important coaching and learning accomplished. That’s what second-year head coach Bill O’Brien’s hopes, anyway. Not quite an all-nighter, but you get the idea. Speaking of which, it’s near the end of the semester at University Park – Week No. 13 out of 15 – and where there’s also a lot of cramming going on. By the professors, trying to make up all the material they missed as the syllabus schedule drifted off-course. And by the students, who figure it might be time to start thinking about that semester-long project. So, there’s a big sense of urgency from University Drive to Atherton Street – and all parts in-between. O’Brien feels it, too. In a big way. Then, O’Brien pulls in the reins for Blue-White Week, practicing his team only twice in the six days leading up to the scrimmage inside Beaver Stadium on April 20: “The last week we’ll probably tempo it down a bit and then get ready for the Blue-White Game. -- In 2012, Penn State’s special teams were bad, to be blunt – but honest. So much so that O’Brien has set aside time every day of spring practice especially for special teams. For good reason. Except for a nice finishing kick by Sam Ficken (10 straight field goals to end the season) and a pretty decent 7.6-yard punt return average by Jesse Della Valle (43rd in the nation), the Nittany Lions need help everywhere, especially from the walk-ons. Among the 124 BCS teams in 2012, under Penn State ranked 103rd in net punting (34.45 yards); 112th in kickoff returns (18.1 yards); 90th in punt returns (6.1); 94th in individual scoring (Ficken, 6.75 per game); and 49th in field goals per game (Ficken, 1.17). Coverage was poor, too. Opponents’ averages were better than Penn State’s by five yards on kickoffs and almost four yards on punt returns. -- In 2013, many youngsters must play like seasoned vets – i.e., running back Akeel Lynch, probable starting linebacker Nyeem Wartman and very talented defensive backs Jordan Lucas and Malik Golden – so they have had to get reps running plays from Penn State’s playbook and not those from opponents’ playbooks, as most of the younger players did in 2012. “There’s a big difference between running our plays compared to what’s on a (special teams) card,” O’Brien said. -- The spring homestretch is the time to try to settle on first-team offensive and defensive units, since summer will be for game-planning based in part on who the starting players will be. Plus, there will be little time to tinker once August drills begin. At that point, O’Brien and his staff will be focused on developing the team and preparing for opponents, not searching for starters. With the extended calendar this spring, O’Brien has allowed for more time for off-the-field study as well as recovery from the workouts, with the resultant expectations of greater focus and intensity, and an increased knowledge of the expanding playbook. State College’s harsh spring weather has been somewhat of a small complicating factor as well. Friday’s practice, No. 8, was Penn State’s first outdoors in what has been spring in name only. Especially this week. It’s big. Dozens of area Cub Scouts and their families flocked to the Nittany Mall Saturday morning to take part in the Pinewood Derby. 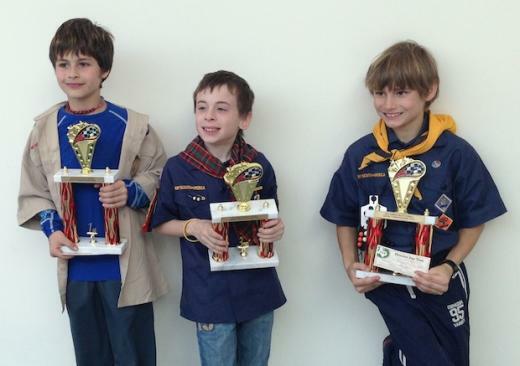 For the uninitiated, it goes like this: The scouts build racing cars out of blocks of wood and then go head-to-head in an exciting competition. Here are the final race standings.